The intro explodes into your ears, and into the public consciousness, as only A Hard Day's Night and Anarchy In The UK have since. So intense, two minutes of sustained viciousness and sheer malicious glee. Singing high and free, even a runaway train can't take his gal away. Scotty Moore and Bill Black never played better, but Elvis's whoop of delight at the end takes the cake. A freaky but inspired choice of first 45 for a major label. To enhance the atmosphere of seedy desolation, Elvis chose to record the vocal at the end of the studio corridor. Encapsulates the live, second-coming - his band never sounded better. The back-and-forths between Elvis and backing singers the Sweet Inspirations ("one more time... yeah, one more!") are the highlight. A teenage pre-cursor to Suspicious Minds, and almost as good. Shadowed by autoharp and a sinister bassline, the victim's pained politeness explodes into paranoia at the end of the chorus: "Why torture me?" No less than an invitation to come join the teenage revolution. "We're gonna rock all our blues away" - the original slang usage of 'rock 'n' roll' was never more explicit. From the GI Blues soundtrack, a Pomus and Shuman ballad of abject surrender. The vocal gets under your skin, keening and helpless - no wonder girls melted. This snarling menace to American moral fibre had to be toned down from "one night of sin" to "one night with you," though the performance is so loaded with sexual promise they needn't have bothered. Cut in 1966 between some of his worst movie scores, the delicate, haunted take on Bob Dylan's song hints at a parallel Elvis universe. Dylan has since hailed it as his favourite cover version. Irresistibly tender. The world's favourite wedding song. Nasty and playful rocker with a burning guitar line. The minimal, hand-clapping groove sent this to number one in '56 for eleven weeks. Inspired by Mario Lanza, adapted for a Cornetto ad, his biggest international hit. Sweaty, southern-fried highlight of his Vegas era. Introduced the classic "uh-huh-huh" to the Presley repertoire. Intense southern soul ballad buried on the b-side of Frankie And Johnny. Eerie clip-clopping reading, with Elvis already sounding like his own ghost, haunting America in 1956. The deepest, most atmospheric song about fishing you'll ever hear. A whisky-soaked Elvis beats himself up: "Whoops, there goes a teardrop..."
A little hesitant, but this is where it all began. The tale of a poor southern singer gone too soon is delivered with unnerving emotion. Jerry Reed’s song was autobiographical, but Presley made it his, and a springboard for artistic renewal in ’68. DJ Fontana’s granite-breaking drums deserve co-star status. First suggestions of his Italianite leanings, this showed America the boy wasn’t always a hoodlum. A graveyard ballad, though death is never mentioned directly, that could have been sung with his mum in mind. True blue-eyed soul, a beautiful song from the ’69 Memphis sessions. If he wanted to, he could still take the dancefloor in the seventies. A minor hit at the time, a standard now. Elvis probably never knew Micky Newbury's patriotic showstopper was ironic. Both the Sun original and the bellowing ’68 comeback version are impossible to resist. Messing about with his own myth in fine style. The dirtiest, truest blues he ever recorded. Boots Randolph’s sax break is filthy. Ludicrous lyric with an insanely aggressive delivery over a drunken, Tom and Jerry-esque Dixieland backing. “Tried so hard, so hard...” His most intense break-up song, this should be better known. Country ham (it was Colonel Parker’s favourite song) handled with real emotion. That voice had an incredible arsenal. Simplistic but affecting, this 1969 number one turned his career around. The Presley entry point for five-year olds. Elvis’s best performances of the early sixties usually involved a love triangle lyric – this slow-dance special was the strongest. Compelling and heart-breakingly sharp teen romance. Elvis, King of Pain, reflects on the imminent collapse of his marriage. 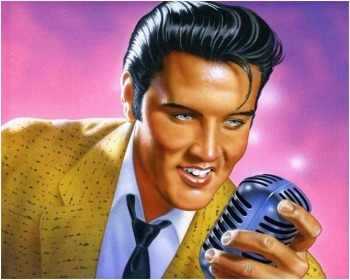 Sam Phillips’ echoed production and Elvis’s hiccoughs invent rockabilly in two minutes. Regrets, he had more than a few. The perfect lounge jazz-blues for 3 am, from Viva Las Vegas. Bo Diddley beat with Latin touches, The Smiths built half their catalogue around it. A soulful roar from ’64, revisited to great effect in the Comeback Special. He bowed out sounding pretty darn contemporary, though JD Sumner’s low, low bass notes take the limelight. Written by Leiber and Stoller as a self-parody; the reading is so sincere, you'd never know. Constantly on the edge of falling apart but hard as nails, the archetypal tough rocker. No matter how many times you’ve heard this song before, the intensity and belief of Elvis’s interpretation will floor you. Find out more about Elvis and his life. More information and links for the King.